A view from the new library at St Joseph’s Nudgee College. Brisbane architecture firm m3architecture designed the library with growth projections in mind. Photo: Supplied. QUEENSLAND will need to build enough schools or expand existing campuses to cope with a projected influx of an extra 47,000 Catholic students by 2036. Based on population growth projections, the Queensland Catholic Education Commission predicts that by 2036, the number of additional students in the Catholic sector would increase by 32 per cent to 194,000. QCEC executive director Dr Lee-Anne Perry said the Catholic sector provides an education for 147,000 students in Queensland. It is the equivalent of one in five Queensland students. “Our estimates are that we will need to fit another 30,000 students into existing campuses in that time and build new schools in high-growth areas for another 17,000 students,” Dr Perry said. As the peak body for Catholic schools in Queensland, QCEC is responsible for dealing with government funding but it is up to each diocese or religious institute to build or expand schools. Dr Perry said the Queensland Government’s decision to include Capital Assistance funding of $45 million per year for three years in this year’s State Budget would help deliver the necessary infrastructure required for growing communities. 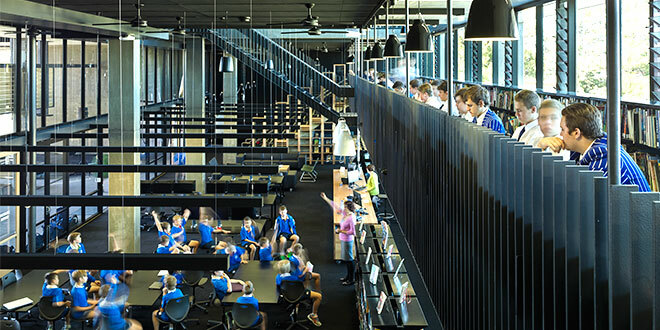 On the ground, Brisbane-based architecture firm m3architecture has worked with several Catholic schools to manage their growth, including Mt Alvernia College, Kedron, and St Joseph’s College, Nudgee. The firm collaborates with school principals to decide where growth is possible and how it can be staged. Director Michael Lavery said the firm was interested in supporting Catholic schools with the imminent growth of school-age student numbers in Queensland. “There is a very large, impending number of children about to hit school age,” Mr Lavery said. As well as managing growth, Mr Lavery said they were working with Catholic schools to swap traditional two and three-storey models of buildings for “newer, equally successful models addressing growth”. There is also potential for Catholic schools to consider new spaces for learning. “In this context rethinking spaces such as the circulation spaces outside of and between classrooms, covered outdoor and landscape space, and places such as the pool, as places where teaching and learning can occur, is potentially transformative for a school,” Mr Lavery said. “The best architects are also thinking strategically beyond the issues of building and density. “The issue of growth is intrinsically linked to the issue of a school’s culture and character.